The 8 Drawer Tall Dresser project is all wrapped up and waiting to be moved into my daughter’s bedroom to finally be put to work. The Tall Dresser looking amazing! 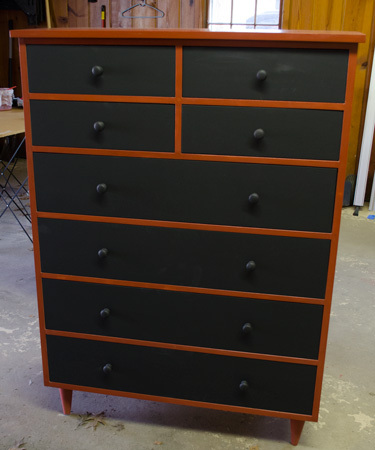 Just in case the color isn’t coming through very well in the pictures, the body of the dresser is a beautiful “Salem Red” Milk Paint from Old Fashioned Milk Paint Store, and the drawer fronts & knobs are all coated with Chalkboard Paint. 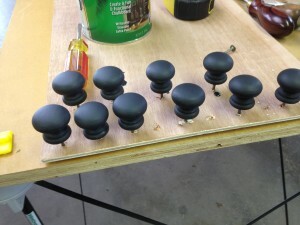 To help add a little extra protection (and to give it a little bit of a luster) at the last minute I sealed the Milk Paint in a couple coats of a water-based polyurethane. The results speak for themselves. I’m very proud of the finished project and hope my daughter will love it for all the years it gets used from this point forward. For those who are interested, I did take the time to record the finishing process. The footage includes prepping the project for painting, mixing the Milk Paint, applying the paints, more surface prep and then finally applying the top-coat. In the meantime a full set of detailed plans are available for sale thanks to Brian Benham of Benham Design Concepts. You can find them by visiting our new “Digital Downloads Store” by clicking here. Thanks for watching and for all your support, more great projects are coming soon. Wow. That looks spectacular. 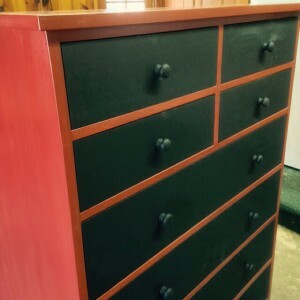 The contrasting colors between the drawers and the rest of the dresser is awesome. Keep up the good work!! 1) if your glue is drying too fast have the company that maintains your furnace add a humidifier and keep it around 35-40%. 2) when drilling on the lathe keep the speed at the lowest setting and you will eliminate a lot of the burning. if you have time contact Scott Phillips of the American woodshop in OHIO he is into turning big time and could teach you a lot. Tom your assumption is correct, I left the chalkboard painted fronts unsealed. If they were sealed they would then just be a “chalkboard appearing” drawer front LOL. I really like the contrasting colours you chose for this project! I’ve been contemplating the idea of using milk paint for an upcoming project of mine and I would like to use two contrasting colours but with my lack of taste (at least for these things), I know I’ll mess it up. Do you have any rules of thumb, ressources or suggestions to propose to find good contrasting colours to use? I don’t really have a good resource to turn to for suggested contrasting colors, but one idea might be to use something like a color wheel. Color wheels will frequently show colors that compliment each other or heavily contrast. Also, I don’t mind at all “borrowing” from color schemes I see and like in commercial catalogs and stores. Most of the time they’ve already hired someone else to figure it out for them so I’m just following their lead.